During the last year, we have hired more than 20 new employees(!) which we’re very proud of. However, with so many new colleagues, team meetings around the table in Tokyo (our second largest meeting room, not the city) were getting overcrowded. If you’ve read this blog post, you know that style and continuity in an office environment are very important to us and a big part of our identity. And finding a new, larger Japanese-inspired meeting table turned out to be harder than expected. 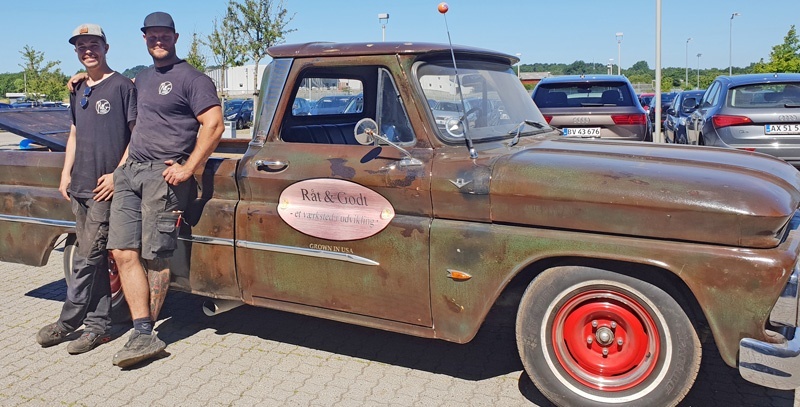 One day when CEO, Michael, was strolling around his neighborhood, he walked past the social economic workshop Råt og Godt where a black table caught his eye. 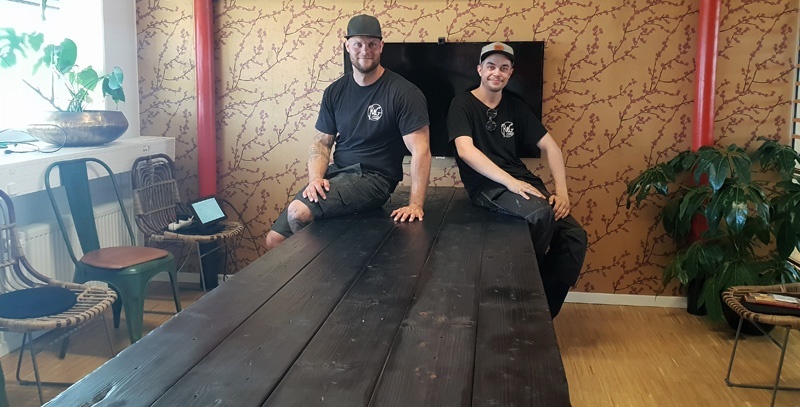 When the founder and manager of Råt og Godt, Christian Helweg, explained that the table had been made using an ancient Japanese technique, Yakisugi (also referred to as shō sugi ban), there was no doubt that this was our new table. From the left: Christian Helweg, founder and manager of Råt og Godt, and Julian Brix, who created the table. Yakisugi is a Japanese method of preserving wood. By charring the surface without combusting the planks, the table becomes waterproof and more durable through the carbonisation. “It was fun to create this table. I’ve tried the method before, but normally we don’t burn the tree as much as we had to with this table to get the deep black color” says Julian, one of the young adults who works at Råt og Godt. Råt og Godt helps young people who for one reason or another isn’t enrolled in education and doesn’t have a job. The workshop works as a manufacturing company but with the primary objective to support marginalized young adults in getting an education and/or a job. All of their products are made from recycled materials, which adds a patina and sustainability to the designs that we really like - and yes, we know what our table served as in its former life. It was a scaffold in Svenstrup, a small North Jutland town near our headquarter. “I’m very happy with our new table. First of all it’s beautiful and absolutely perfect for our Tokyo meeting room. Second of all, I really like the whole idea behind Råt og Godt and their values and that's also why I really want to share the story behind the table”, says Michael.